During a holiday in Corfu island, no one can miss to taste the most famous Greek dishes and some traditional food of Kerkyra. 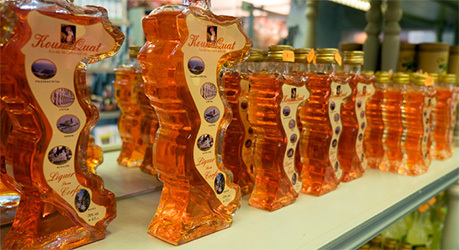 In all Corfu island are very important some traditional products as local honey, extra virgin olive oil and sheep yoghurt, but also some local recipes like “Pastitsada” and “Sofrito” are really excellent. start and finish your meal only with starters! 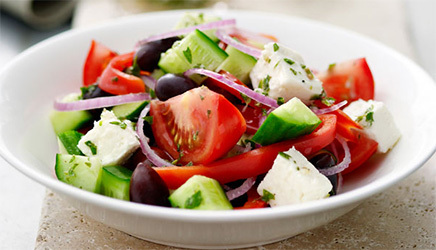 Some traditional starters are Melitzanosalada, Taramosalda and Tzatziki that are creams made of eggplants, egg fish and Tzatziki, the most famous, of yoghurt, garlic and cucumber. There are also a couple of delicious starters which are traditional of Corfu island: Numbulo and Burduni. Numbulo is a particular ham that you can find only in Kerkyra island and it is prepared with smoked pork fillet. Burduni looks like a sausage, made with pork blood, livers, onions and spices, you will eat it fried and cut in small slices. It's not easy to find this starter in the restaurant. Other kinds of cold cuts that you can find in Corfu are the sausages, the bacon and the "salado" that is a salami not smoked. You can also find many other kinds of salads made with potatoes, chicken, lettuce or beans. 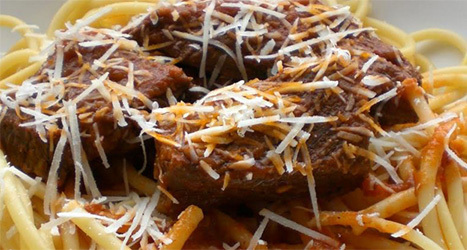 Greek people love meat and in Corfu’s restaurants you can find a lot of meat dishes. Traditional dishes from Corfu that we would like to suggest you are Sofrito (veal cooked in wine sauce, garlic and white pepper), grilled lamb, turkey soup Avgolemono and Pastitsada (veal or chicken meat cooked with fresh tomatoes, cinnamon, wine, onions and different spices. 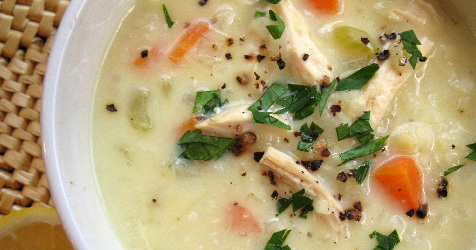 It is served with pasta or potatoes). Come on, Corfu is an island, so... a lot of fish for any age and pocket! Together with the classic fresh fish that can be grilled or cooked in the oven and beside seafood there are some local recipes that are famous all around the island of Corfu. 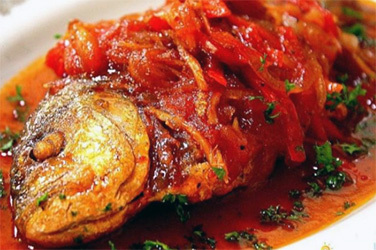 The Bourdeto is a sort of fish soup in a spicy sauce made with red pepper, onions, salt and extra virgin olive oil. Another fish course that we would like to suggest you is the Bianco that consists of different kinds of fish cooked with wine, lemon juice, garlic and vinegar. Finally the Savuri consists of fried fish served with a garlic sauce, rosemary, vinegar and raisin. Some very famous and delicious dishes are the Imam eggplants (eggplants filled with onions, tomatoes and baked into the oven), the Briam (potatoes, eggplants, zucchini and tomatoes cooked in the oven), and stuffed tomatoes and peppers (they’re filled with rice and tomatoes). Local people like also very much wild herbs like Tsigareli that are fried with garlic and pepper or Agriolachana that is boiled and served with olive oil and lemon. 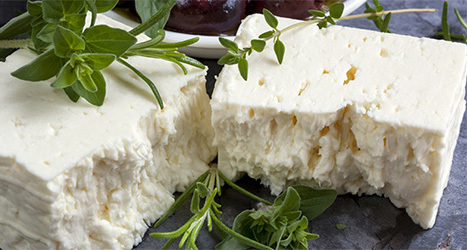 All over Greece there’s a great production of cheese and in Corfu island you have the opportunity to taste most of them. 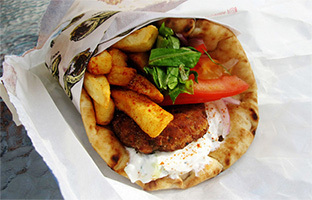 The most common cheeses that you can find in every restaurant are the Feta cheese (prepared of goat milk and with a hot spicy version), the Manuri (white and tasteful also made of goat milk), the Kefalotiri (a particular hard paste cheese that is ideal to be grated on top of spaghetti) and the two traditional cheese: Tirokafteri and Ladotiri. The first one is a soft kind of cheese with pepper good to be smeared on the bread. The second one is a hot spicy cheese that is also used for preparing some other dishes. If you give a look into a pastry shop here in Corfu island you realize that you can find everything you like with cream, chocolate or fruit. 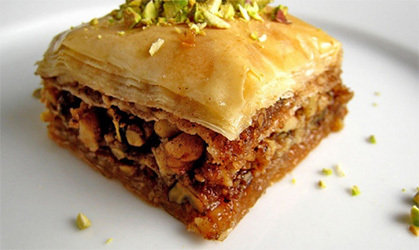 There’s also a puff-paste covered with sugar and cinnamon and filled with a special cream named Bougatsa. If you come here in Corfu you have to taste the famous Sicomada, a kind of cake prepared with dried figs, almonds, orange skin, pepper, cinnamon, wine and Ouzo. Some other traditional sweets that you can find only in Corfu are the Tsaletia (kind of bread with raisin and corn that is fried and covered with sugar), the Fogatsa (kind of croissant) and the Tzintzola, made with dried jujubes, raisin and sesame. The best way to finish the meal is a Greek coffee. For people from Corfu is like a ritual to prepare it. The island of Corfu is also the only place in Europe together with Sicily where you can find the Kum Quat, a strange kind of tangerine. This little fruit was imported in 1850 by English and today is used to produce the most famous liqueur of Corfu, the Kum Quat. Another particular drink that is traditional from Corfu is the Tsitsibira that is very tasteful and fresh and is prepared with fresh lemon juice, lemon oil, water, sugar and ginger. Concerning wines, the production of Corfu was great during ancient time, but Venetian imposed the cultivation of olive trees and today there are very few areas where grapes grow up. The wines that are still produced in Corfu island are the Petrokoritho, the Fraula and the Skopelitiko that are red wines, while the Kakotrygis, the Martzavi, the Afioni and the Robola are white. In Corfu the taverns are almost always open and the owners very friendly and nice in suggesting their menu or dish of the day. In many taverns it is possible to assist to local dances accompanied by Greek music such as Bouzouki or Sirtaki folk songs entertaining while waiting to be served.